Joseph, the third child of Wilhelm and Theresia Westhues, was eight years old in 1892, when the family migrated from Haltern, Germany, to Glasgow, Missouri. Theresia's mother, Joe's grandmother, and five of her brothers, his uncles, were already settled in this new country, on a farm just a few miles from the farm his parents bought. Two of those uncles, Fritz and John, were already studying for the Catholic priesthood. They continued their studies as Joe was growing up. Fritz was ordained in 1898, when Joe was 14. John was ordained in 1902, when Joe was 18. Joe could not have helped but observe how deeply respected these two uncles were, for the clerical vocation they accepted and embraced. Joe followed in their footsteps, leaving home to enroll, as they had done, at Quincy College in Illinois, an institution run by German Franciscan Fathers. For his theological studies, he enrolled, again like his uncles, in Kenrick Seminary in St. Louis. Like them, he would be ordained a priest of the Archdiocese of St. Louis, at whose westernmost edge the parish of St. Mary's in Glasgow was located. Had the Westhues family settled on a farm on the other side of the Missouri River, it would have belonged to the small parish of All Saints, West Glasgow, and Joe would have been expected to entrust his priestly aspiration to the Bishop of Kansas City. If the farm had been on the other side of the Chariton River, the Bishop of St. Joseph would have had first claim on Joe's priestly vocation. As it was, the farm's location oriented the family ecclesiastically and culturally to Missouri's largest city. Two commemorative holy cards were printed and distributed at Father Joe's First Mass in 1907, one in English and one in German. He was fluent in English, of course, but German was still the language of his parents' home, and of many other German immigrant families in the Glasgow area. It was the only language Joe's mother spoke. Then as now, the normal career path for a diocesan priest was to be assigned as curate or assistant pastor in large parishes for ten or fifteen years, then be appointed pastor of a small parish, and finally of a succession of larger ones. 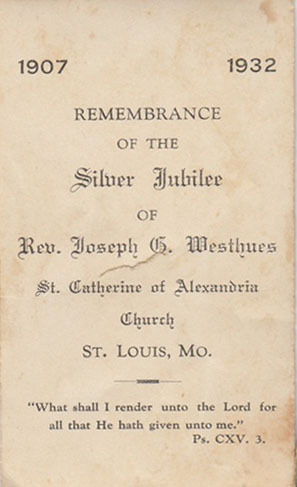 The young Joseph Westhues served during the 1910s as assistant at Holy Trinity Parish in the predominantly German Soulard district of St. Louis. The large Gothic church still stands at the corner of 14th and Mallinckrodt. 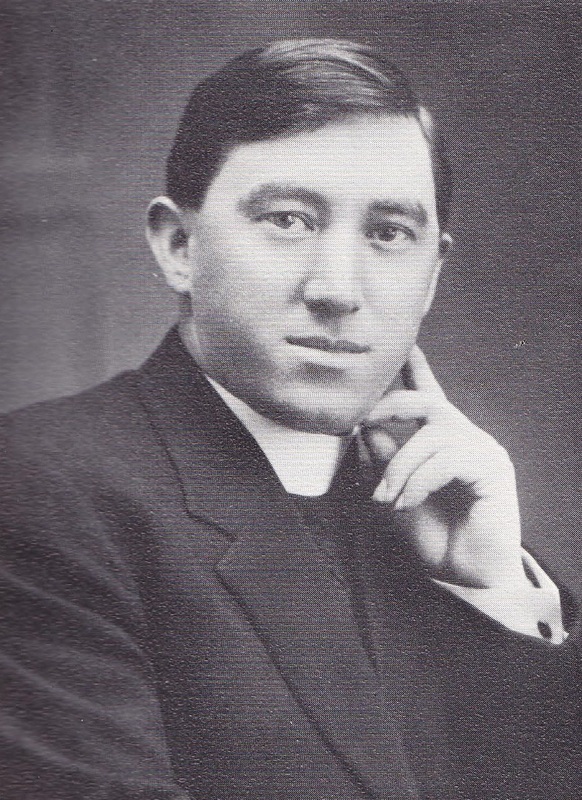 Instead of appointing Father Joe to an established parish, Archbishop Glennon entrusted him in 1921, as he had earlier entrusted his two uncles, with founding a new parish. Father Joe's was named for St. Catherine of Alexandria, in what was then the new suburb of Riverview Gardens. The parishioners there were not affluent. Father Joe did not build an impressive church, instead a multipurpose building housing both church and school. The parish struggled financially throughout Father Joe's pastorate. A church of impressive architecture was at last built in 1958, twenty years after Father Joe's death, but by then, on account of postwar shifts in urban populations, the number of Catholics in the area was already in decline. In 2005, the archdiocese merged this parish with another. In 2009, the buildings were sold to an African-American Baptist congregation. Father Joe had a special place in the family of his younger brother John, my father, for having officiated in 1922, in the new parish of St. Catherine's, at John's marriage to my mother, Olive Conran. John and Olive were engaged and planning a spring wedding in October of 1921, when Joe's and John's father Wilhelm was killed in the farm accident. By the family's rules of mourning, no event so festive as a wedding should take place for one full year in the home community. 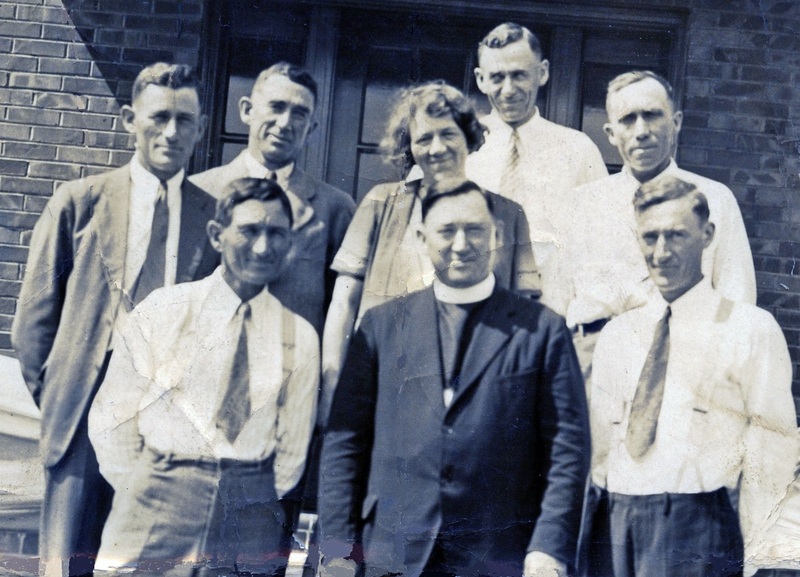 Father Joe agreed to perform a very simple ceremony in his new parish on April 26, 1922, and to host breakfast afterwards for the wedding party. Joe's and John's widowed mother Theresia traveled to St. Louis for the occasion. So did their younger brother Fritz, who served as best man. In 1932, Father Joe celebrated the 25th anniversary of his ordination by hosting a family reunion at the parish he had built in St. Louis. Below is the souvenir holy card, and a photo of him with his seven surviving siblings. Two of Wilhelm and Theresia's ten children, Theresa and Mary Flaspohler, died at a younger age than Father Joe. He was the first of the seven boys to die. 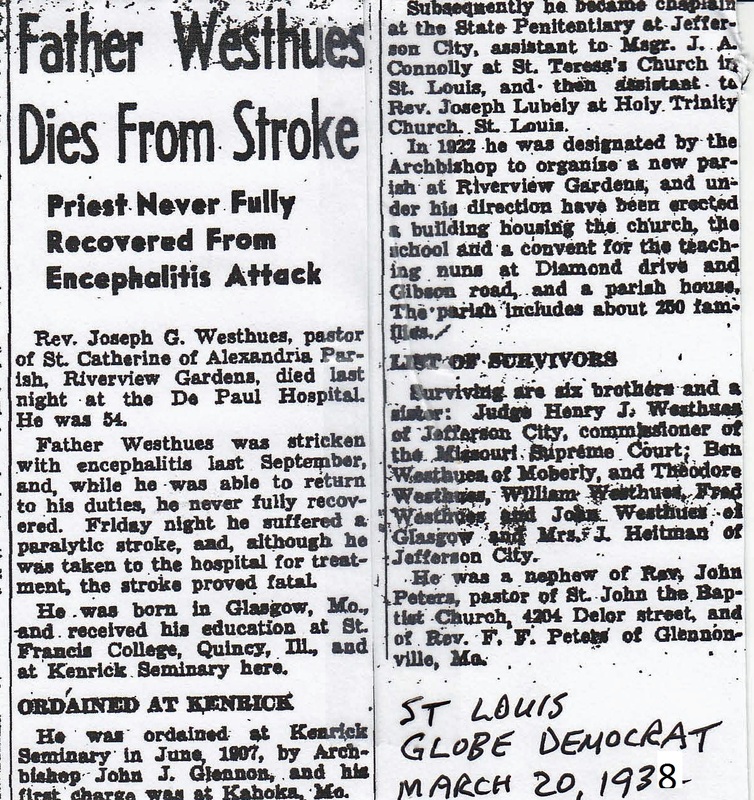 Below is the obit from the St. Louis Globe Democrat, on March 20, 1938. The article incorrectly gave his birthplace as Glasgow — it was in fact Greven, Germany. The article also misspells the surname of his sister, Anna Oidtman.